Philadelphia, PA – July 22nd – Particles Plus exhibited at the Indoor Air 2018 Conference. This was the 15th annual event for the International Society of Indoor Air Quality and Climate (ISIAQ), hosted by Drexel University at the Pennsylvania Convention Center in downtown Philadelphia. Researchers, academia, and Indoor Environmental Professionals attended to share results from research projects over the past year, and present their studies and findings. During the course of the event, the venue was subjected to nightly construction. 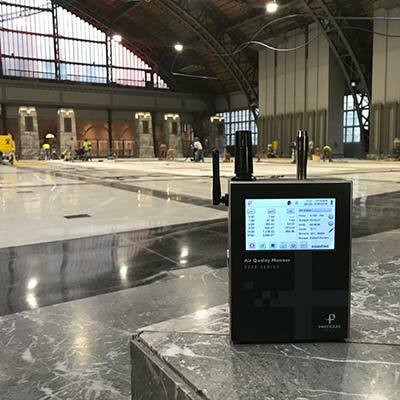 This allowed for an opportunity to monitor the particulate levels in the main concourse which housed the escalators and elevators between the two levels of the event. The contractor who was saw-cutting concrete and stone for floor repairs utilized wet cutting techniques, and had filter capture devices connected to all of their cutting heads. Even with these precautions, the PM 2.5 levels were elevated to 64.82 µg/m3 and PM 10 registered over 955.65 µg/m3 in a public accessible space. These levels were in stark contrast to the amazingly low particle counts found in the upper level exhibit hall and poster presentation room where the mass concentrations for PM2.5 were around 2.75 µg/m3 almost all week long, with peaks of 4.0 µg/m3 during the highest peak attendance times with the highest occupancy and foot traffic.